A boy with a gun waits for the man who killed his mother. A troubled detective confronts her past in the aftermath of a brutal shooting. After thirteen years in prison, a good cop walks free. But for how long? And deep in the forest, on the altar of an abandoned church, the unthinkable has just happened… This is a town on the brink, a road with no mercy. I once heard someone say, during a debate about popular fiction 'versus' literary fiction, that if anyone snobbishly claimed crime writing was an inferior form that could never meet Booker Prize standards, you should just throw a Peter Temple book at that person's head. I replied that you could alternatively push an entire bookshelf of James Lee Burke novels atop such snobs. Irish author John Connolly, himself a poet of the crime genre, calls Burke (who is flat-out one of the best American novelists of any kind) the world's greatest living crime writer. I agree. But with REDEMPTION ROAD, I think John Hart has cemented his place as Burke's heir apparent. After a five-year absence, Hart has returned with a powerful, intoxicating tale that manages to be both skin-crawlingly disturbing and achingly beautiful at the same time. Filled with a vivid cast of chasm-deep characters, REDEMPTION ROAD is a tour de force of Southern Gothic storytelling, a potent concoction of tense thriller, atmospheric evocation of the rural Carolinas, and literary mastery. Elizabeth Black is a cop under pressure. She pumped 18 bullets into two black suspects while rescuing a young girl. Questions swirl, as does the media frenzy, and Black refuses to help herself with how she responds. Meanwhile Adrian Wall, another North Carolina cop whose career went even further off the tracks, is released from prison, body and mind deeply scarred by 13 years of tortured existence. He still protests his innocence, but few believe him. Black always did but she's not sure now. A young boy wants revenge, a young woman struggles to deal with her abduction and rescue, and behind the scenes a dark soul stalks the local byways and back roads like a malevolent wraith. 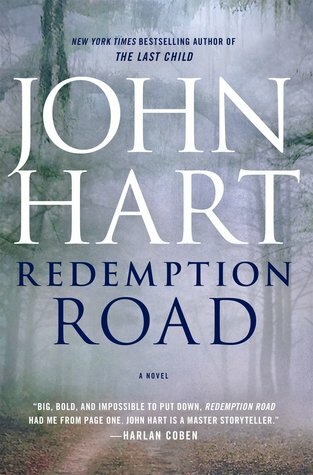 It seems like there are a lot of ingredients to juggle in this complex, multi-layered story, but in Hart's adroit hands REDEMPTION ROAD never feels over-egged. It's elegant, lyrical, and absorbing. Deeply satisfying as a crime novel and a very fine piece of literature. In a way, it just gets under your skin, becoming a stay-up-all-night page-turner even though Hart doesn't resort to staccato chapters, ticking clocks, or other gimmicks. Instead, suspense seems to flow naturally, organically, from his richly drawn characters, their internal battles, and the way in which their lives connect and collide. Similarly, although Hart luxuriates in language, and deftly evokes the unhurried nature of the American South, REDEMPTION ROAD never feels too leisurely in pace. It's not a fast-moving thriller - there's too much richness, depth, and texture for that - but then it doesn't feel underdone when it comes to tension and action either. Hart finds the sweet spot, then knocks it out of the park. 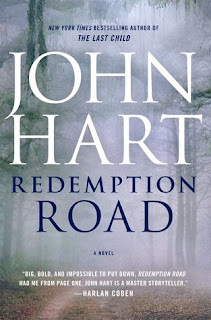 A small caveat, as I fear this review could almost read too cheerleader-ish: not everyone will connect with REDEMPTION ROAD in the way I did, or appreciate Hart's blend of literary quality and first-class crime writing. While John Connolly, myself, and many others may consider James Lee Burke the greatest living crime writer, his books certainly aren't for everyone. Likewise those who prefer 'airport thrillers' with cracking plotlines unslowed by character, setting, and deeper themes may not click quite as strongly with REDEMPTION ROAD. But regardless, I think John Hart's latest tale of deeply wounded people scrabbling for something good in a tough world would still be an enjoyable read for most crime fans, and an exquisite read for many. And it just might make Hart the first author to ever win three Edgar Awards for Best Novel. He's certainly my leader in the clubhouse. Craig Sisterson reviewed REDEMPTION ROAD for the Spring 2016 issue of Mystery Scene magazine (out now). This is a longer and more in-depth review, unhindered by word counts. Some phrasing may be similar.